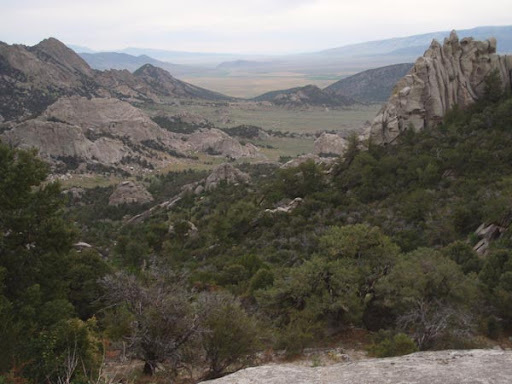 We set out under a cool, overcast sky and headed for the high trails in City of Rocks National Reserve. Today's was a 14-mile loop, skirting the Circle Creek valley like yesterday, then climbing. Above the valley, up and up on great trails, from 5600' at basecamp to 7200', through forests of pinyon/juniper, passing into old stand aspen forests, up and up along the North Fork Circle Creek Trail. Even higher, monster granite outcroppings played hide and seek in a tall mahogany forest. We gained a saddle in the trees, and like magic, a spring-fed water tank awaited our horses, along with a lush spot of grass. We might have continued on to a higher ridge trail but for the gathering dark, somewhat ominous clouds foreshadowing the 30% chance of thunderstorms predicted for today. 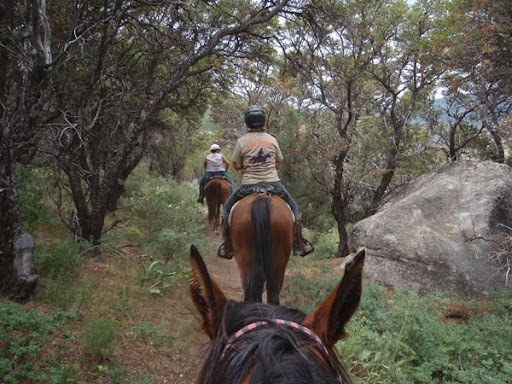 One rider voiced worry about being caught up on a high trail in a thunderstorm. The others agreed, but I think they were more worried about being caught with me up on a high trail in a thunderstorm. I don't do lightning well. We descended an equally well-maintained trail down to Emery Pass on the main road through City of Rocks. It's a picnic area for humans and an idyllic picnic area for horses. They gorged on many kinds of shoulder-high grasses while we snacked and looked over maps. Climbers worked their way up the Bread Loaves. We marveled at the craziness of the climbers, and they probably thought the same of us, trotting merrily down the trail. We headed back towards camp following a ridge trail - into darker clouds and scattered rain showers. Dropping down to the valley floor, a refreshing rain shower (no lightning!) enveloped us in the heavenly sage perfume of the desert. The trails go on and on in the City of Rocks. We've not found one yet that is rocky or treacherous underfoot. The scenery makes your eyeballs water. No wonder people have been impressed with the place for 200 years. 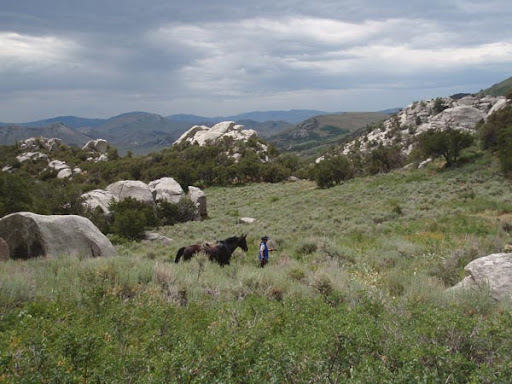 We've found several possibilities for basecamps for a multi-day ride; we've found more possible trails in the BLM lands to the west, and possibilities for vet checks at an old cemetery and an old schoolhouse on the California Trail. Steph knows an endurance rider who knows the person who owns the land we can ask for permission to use on parts of the California Trail. Lynn has connections who can find landowners we want to talk with. Juanita at the visitor center knows the area and locals and trails and is helping us figure out and plan things. The doorways keep opening. The trails keep spreading out in front of us. Things just keep falling into place. 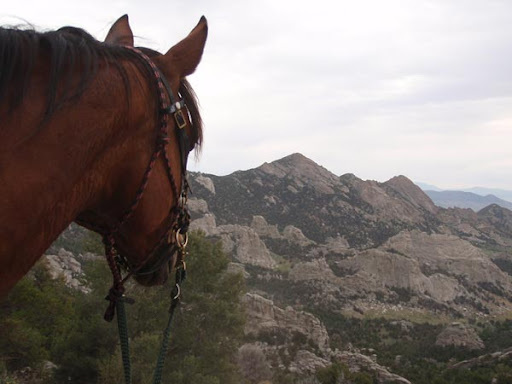 A three or 5-day endurance ride is just inevitable here next year!